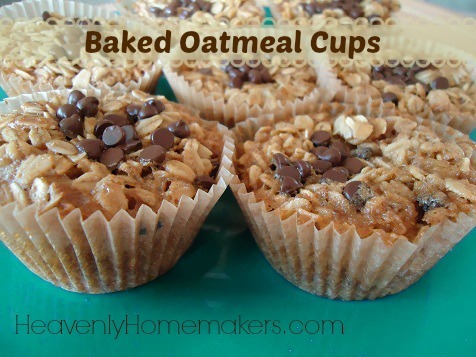 Baked Oatmeal Cups are perfect for a spring breakfast. My four boys are just about getting too old to appreciate anything cutesy I try to make with food. When they get up in the morning, they bound into the kitchen, excited to see a big pile of bacon on a tray with a dozen scrambled eggs and mountain of pancakes. Does it really matter to them if I tried to arrange the food in such a way as to make the platter look pretty? Do they even care that I woke up extra early, and lovingly mustered all of my artistic ability to form the pancakes into the shape of the country of India? After all, we’ve all been enjoying our studies about William Carey and his missionary efforts there. Who wouldn’t have fun smearing butter all over Calcutta? I figured they’d be thrilled! But no. They don’t care at all. They just want me to hurry up and pass them the maple syrup and while I’m at it, another slice of bacon. I’m telling you, I am sooooo unappreciated around here. From now on, I think I’ll just flip some boring ol’ round pancakes straight off the griddle and onto their plates ten feet away. I’ll skip the serving platter. I won’t mess with a lovely presentation of fruit arranged on a plate in the shape of a clown face. They can just stuff their faces with “normal” food for all I care. Now that I’ve thrown a fit that is so becoming of a grown-up, I suppose I should now confess that my intentions and my artistic abilities are not even close to being able to pull off much of the above. I’ve never really attempted to make pancakes into the shape of India – or any other country for that matter. Incidentally, I did turn out the state of Texas once, but that was totally an accident and as usually happens when I have not gone out of my way one little bit, my boys were actually quite impressed. I obviously got right on that, but ended up instead with a lopsided gourd and another pancake that resembled the fuzz under my couch. I gave up at that point and figured they could chew the pancakes into the shapes of their requested states, because really, have you ever tried to pour Florida onto a griddle with a spoon? This leads me to the special breakfast I made recently in an effort to be cute. It is spring after all. Doesn’t the idea of eating a bird’s nest for breakfast sound simply delightful? Okay fine. We can just call these Baked Oatmeal Cups. Either way, these are easy to throw together and are versatile enough to add variety and meet your family’s taste preferences. Mix together oats, sucanat, salt and baking powder. Stir in eggs, milk, and melted butter. Scoop batter into 12 paper lined muffin cups. Sprinkle toppings of choice into the center of each cup. Bake in a 350° for about 30 minutes, or until the oats are golden brown. These are easier to eat with a fork, unless you like cleaning partial bird’s nests up off of your table and floor. If you prefer, simply spread the mixture into a 9×9 inch baking pan. Bake in a 350° oven for 25-30 minutes. Do you try to be cute when you cook and bake at your house? And how do those efforts go over for you? Ever tried to make India out of pancake batter? These look so yummy! I like that I can “customize” them to flavors each kids like too. What is the texture like? Re pancakes–I do make lots of animal shapes and my 4 yr old is quite impressed. Thankfully, He has a great imagination and optimistically sees the desired animal shape. Sorry haven’t tried to make pancake states, but Micky Mouse and other animals have been requested. These ‘Bird Nests’ sound yummylious as my boys would say. Do you use quick oats? No, I use old fashioned rolled oats. The “bird nests” look very yummy! Now that the kids are saying they don’t ‘like’ oatmeal anymore I have several containers of it that needs to be used up! My kids are sick of oatmeal too, so these have made a nice substitute! I have found that men ( my daughter isnt really old enough yet) when i dont do the special little things he then will say something to tjhe affect of oh u didnt cut it how you normally do. or its not special. and i usually reply with well i didnt no you liked it because you never said anything. and then he replies with well i ate it didnt i. haha. they really do like the little cutesy special things we do even if they dont say. my husband enjoys the notes i send with him often in his lunch. he has said b4 owe it would have been nice to see a note today. but i agree feeling acknowledged when you do special things makes you want to continue. I am feeling a little bit under appreciated and though I know I should do everything for HIS glory…it would be nice to have a kind word now and again. By the way…those “bird’s nests” look smashing! What a great idea! Thanks for this tip. My kids are really goofy and still love fun shaped things like mickey mouse or snowman pancakes. I have a ketchup bottle under the cupboard right now waiting me to fill it with something. I often wonder if my presentation efforts would be noticed if I had a housefull of girls instead. I enjoy trying to make the table look pretty, and I tell myself they really do notice but simply expect that as normal. Yes, girls do notice and care about presentation more. They are always wanting to make placecards for each person when they set the table and like to add candles and flowers too (mine are ages 13, 9 and 6). My boys (12 and 6) like fun shapes and creativity with the food itself if it is gross or a critter that they can pretend they are eating. They loved the alligator cake for the safari birthday party and the Cair Paravel birthday cake for the Narnia birthday party. They also loved the gross names for the food at the safari party. Do these freeze well? It’s just the two of us and I’m not sure he’d even eat any so it’d just be me. I have seen these all over pinterest. I have always made a double batch of baked oatmeal. then I take that extra and cut it in to single serve pieces and freeze. I do like that the boys can customize theirs when we do them in the muffin pan. We do not get cute with our food either. My youngest is 17 years old all he cares about is getting full. His favorite meal is breakfast which for him is a waffle sandwich with peanut butter and jelly or peanut butter w/Nutella, a bowl of cereal and a glass of milk usually chocolate. Thanks for sharing this recipe. They look delish! Can you substitute Kosher Salt for the Sea Salt? I think kosher salt should substitute just fine in this recipe. These were amazing! 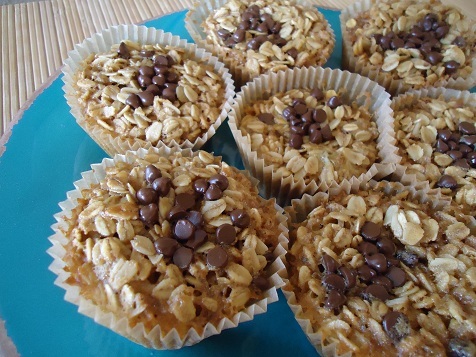 I make a baked oatmeal that my boyslike, but I like the flavor of these much better! Can you tell me why you use paper liners? Is it for clean up purposes? I have a Pampered Chef 12 cup muffin stone that I love, so I don’t use paper liners. I thought maybe if you used a metal pan it would be necessary. Thanks for the info and this recipe! Blessings! Yes, I’m lazy, which is why I prefer the paper liners. Plus, I just have aluminum muffin pans so I don’t want the aluminum to leach into our food. I will have to try these…for 2/3 of our family, anyway (my oldest and I can’t stand oatmeal :) )…I usually make heart shaped pancakes or waffles in February and snowflake shaped pancakes off and on through the winter…the kids love them, but since I only have a few of the pancake molds and the heart-shaped waffle iron burns the food after a few rounds, it doesn’t happen nearly as often as they’d like (my kids are 8-4)! I used to makes pancake shapes for my son when he was little, but no matter what I tried to make, they always seemed to look like Mr. Potato Head :) My son was still impressed though! Laura, I am always looking for a quick, easy, healthy meals to serve at a church camp…is this something that can be baked ahead of time and then just heated up in the microwave the day we want to eat them? Yes, definitely, these can be baked ahead of time! I’m like you, I don’t bother with making cutesy food. I see fancy fun food in magazines and I always say who has the time to do all that work. Although for Christmas I did do Reindeer Cupcakes with my 4 yr old son, but they were pretty quick and easy. As for pancakes, I make Swedish pancakes which is a very thin batter so it’s too difficult to try and make shapes so I don’t even bother. This recipe looks tasty though, so I will have to try it out. Just exactly what I’ve been looking for — for ME. My creative cooking days are over, but fondly remember Daddy creating pictures on our plates with food. We were thrilled and raved about it. Mom, I think, was a bit ticked because we took HER food for granted and just ate it. About once every 6 weeks, she’d take off for a day of shopping and Dad would watch us. Know she would have like him to demonstrate his culinary skills every Saturday. Your story generated lots of memories for me. I wonder if you could bake these nests with eggs in the middle? Although I think the flavors may not go together. Have you ever made baked-eggs-in-pie-crust-nests? Or something of the like using your multipurpose dough? I would love a recipe for that! Hmmm, I love the idea, but I’m not sure an egg baked in these would be good. One friend gave me the ide of using hashbrowns then eggs baked in a muffin cup. Sounds awesome! Oh wow, that does sound good! Do you fry the hash browns first, or do they crisp up when you bake them? What’s the oven temperature? Yay, so glad for this recipe Laura. I plan to make it for our new teen youth group Sunday morning. We just started the youth group a few months ago and at first I was comfortable feeding them junk food that I normally wouldn’t serve my family but after we are feeding them more often, I’ve got to search your site for some healthier versions of breakfast, snack and dinner ideas, even drinks because they all love soda. Thanks for this recipe. I’m going to soak the oats and milk and see how it goes. Adding a bit of cinnamon and vanilla makes these even tastier!!! We made these today… SO GOOD! My favorite thing about this recipe is that my 2 year old was able to help me from start to finish! I love finding recipes where she can truly be a help – dumping, stirring, cracking eggs, and sprinkling on the toppings. Thank you so much! Thank you for this idea! Am going to try these as we can’t bring any snacks with nuts in them for a certain church location due to it being an nut free zone and most of our favorite granola bars and trail mixes I make include nuts or nut butter of some kind. This will be a great snack alternative for my kiddos. i love that many of your recipes use what i have on hand. How do you think substituting coconut oil for the butter would go over in this recipe? I’m trying to avoid dairy to see if it helps w/ my kids’ excema. THoughts? choice but in my house with many allergies its the safe choice. My HUSBAND appreciates cutesy things–like a giant bat-shaped cookie on halloween with, “I’m batty for you.” written on the front as a surprise in his lunch box. My kids go bonkers for things like green clover molded jello on St. Patricks day and ga-ga for birthdays but could care less about a pretty tray on a regular day. Do these stick to the wrapper or come out in one piece easily? Have you tried them? My first try, they stuck and we needed a spoon or fork to eat them. Today I ended up chilling a pan of them before baking and the one I just tested came out quite easily. I found this recipe years ago in Southern Living. I’ve been making it (and eating it!) for…hmmm…5 years. I LOVE IT! I’ve officially burned out most of my family members on it! ha! I love a good “food rut” so I’m sticking with it! :) The recipe that I use calls for frozen blueberries, which pair so well with this! My recipe calls for cinnamon too, which is so yum! I’ve never thought to make these in muffin-portions OR to use chocolate chips. LOVE this ideaa!! Has anyone ever tried peanut butter inside them? My boys (6 & 17 yrs. old) don’t say much, but if I haven’t made something special in awhile or decorate for a holiday soon enough, they make comments. So I know they really do enjoy the little things I do to make our meal times “homey”, even if they grunt out a “thanks” only once in awhile! Now my 12 yr. old girl is much more verbal, especially when something tastes particularly yummy to her, plus now she is starting to cook a little herself…and by the way your recipes are so easy to prepare, that they’re perfect for beginners! Thanks for your healthy options, we have made many of your recipes and they are becoming staples in our home! Wow! Another great-looking recipe. Putting in my arsenal!! Thanks. I made a batch of these today and they are SO TASTY! I have tried other baked oatmeal recipes but they always seemed so dry to me, this one is moist and yummy. Thank you!! I just had to tell you that I tried this recipe a few weeks ago and my children (13, 10 and 1) now request them at least two times a week. I have to make extra batches to keep on hand to snack on or for an “on the go snack”. They really enjoy them with the apples on top. I put just a smidge of brown sugar over the apples and yum, yum! Thanks so much. I’m sure I’ll be making this one for years to come. You crack me up! Just about every one of your posts makes me smile or giggle. thanks for that! Made these this morning with gluten free oats. YUM!! I have a question though: the bottoms turned out a tad mushy…not that this was a bad thing, mind you. But I wasn’t sure if I needed to bake them a bit longer? I refrigerated the leftovers and quite frankly…they taste wonderful cold. Not sure I’m patient enough to reheat them. I am betting baking them a little bit longer would have helped with that! I wonder, could you make these without the muffin cups? Like cookies or bars? Would they hold together enough to eat with your hands? This would definitely work as bars. They may be a bit crumbly without muffin cups though. OOOOO OOOOO! So excited to have something useful to share! I made these today and had to dash out before I could bake the 2nd tray. I popped them into the fridge while I was gone. I just baked that chilled tray and tried one of them. They came out of the muffin paper quite easily! Yay! That might be the trick to less messy birds nests! Chill the muffins before baking. I know it adds time, but makes them easier to take to large gatherings (like rowing regattas where these are going tomorrow). If I’m feeling adventurous in my pancake shape making, I’ll use a large funnel. Pour the batter in and use my finger as the “on-off” switch. Sometimes the results still require much use of imagination, but other times it works out quite nicely! I’m making these muffins tomorrow for breakfast. Thanks! Does anyone who’s made these muffins know how many this recipe makes? I usually cut 5 Tablespoons off of the butter stick, which is 1/3 cup, then I melt it down. That is the easiest for me! Has anyone tried substituting fruit butters for the butter? I use homemade pear, apple, or plum butter in place of butter in cakes and bars and thought this might be a way to get the fruit in without making them to moist. That’s a really good idea and I think it would work great! LOVED THIS! I keep hearing about baked oatmeal. I finally made it. I put chocolate chips and raisins in the muffin papers. Then with the other half (I doubled the recipe), I put it in a 9×9 pan with some cinnamon and apples and raisins. P.S. the reason I doubled the recipe is because I accidentally tripled the milk and double the honey. Siphoned off some milk, doubled everything else and phew, the day was saved. Made it for my family when we were in Wisconsin and it was a hit. Made it for MomsNext Today with dried cherries and chocolate chips; again, a hit. I keep skipping the muffin cups and making it in a 9×9 pan. Doubled in a 9×13 pan. Perfect timing, my daughter is learning /N/- nest and my 2nd grade son is studing about birds. I know what we are having for breakfast tomorrow. Would you be able to offer any egg substitutes for this recipe? Thanks in advance! I recently discovered your site and have really enjoyed it. This morning, I made these for my family and they were a big hit! Could these be stored for later use in the week?? Would you put them in the refrigerator or freeze them? Thanks for this recipe! I made it for the second time this morning, and I just LOVE them! So delicious with apple and cinnamon on top. I made these this morning and there are only two left. I put semi-sweet chocolate chips on top and they turned out great! My picky teenage daughter ate two (after adding more chips). I am trying to switch to a Real Food diet. My daughter is not thrilled about this (she is a hard-core processed food teen). I’m glad I found a recipe we both like. I like stirring my “toppings” in before baking. Can you make them the night before, store in the fridge, and then bake them the next morning? Just tried this and the kids really liked them! Thanks for another great recipe. I was out of butter and protective over the last stick so we used oil and it worked fine. Also, we soaked all except the eggs and baking powder overnight, then added them in the morning. Would regular thick rolled oats be okay for this or should they be quick oats? I made these and, while the flavor was great, they came out super dry. I am NOT talented in the kitchen — is there something specific I may have done wrong, or something I can do to try to remedy it next time? Oooh…made these this morning and we really liked them – we were thinking about monster cookies (peanut butter and m&m cookies) while we ate them. Do you think it would work to add peanut butter and how much would you add? That sounds amazing! You could add it as a topping and use as much as you like. You are such a hoot!!! I would have waaay too much fun if we lived close to one another. Moms have to have a sense of humor. Or we would cry all the time. I remember my son bragging about something bad he had done, and I had no reaction at all, whatsoever! He turned around to tell a guy sitting near us, ‘woah, you took that better than I thought you would’. He asked, “Mom? Are you ok?” But, I thought oh hunny, I could cry and yell and freak slam out. What’s the point. You just want my attention. So, I might as well just sit there and listen. do you need the paper cups or could you butter the muffin tins? I made these with a few modifications…I used 1c. rolled oats and 1c. steel cut oats for some texture, vanilla unsweetened almond milk instead of milk and unsweetened applesauce instead of oil. I then mixed in some cherry flavored craisins and chocolate chips. They were incredible!!! I will definitely make them again and again, trying different mix ins each time. Anything I can use in place of eggs or omit them?? I think they would be crumbly if you omit the eggs, but I’m not sure how to replace them. I’ve heard flax can be an egg replacer?? Do you ever skip the cups and bake it in one baking dish? Do you adjust the time at all for this? Just, I just added the specifics for that. Thanks for reminding me that I hadn’t included that info! I spread it into a 9×9 inch pan. Bake at 350 for 25-30 minutes. Love these. I have a grandson allergic to eggs . I replaced the eggs with bananas. 1/4 cup of mashed bananas for an egg. I also did not have honey , I used maple syrup. They were delicious. You can also use applesauce as a replacement for eggs , but I didn’t try that yet in this recipe. Thanks for this great recipe. I add frozen blueberries all the time. It is actually my favorite version of this. I will also add a little vanilla and cinnamon when I do blueberries. I am sure strawberries would be great too. Just put a double batch of these in the oven for the Kids Breakfasts …. My Son is already pacing the kitchen waiting for them to be done so he can do the ” official” taste test…..
How are these as leftovers and do they freeze well? These do great as leftovers and freeze great too! The closest to cute we get is leaving one whole olive in a meal that calls for chopped. Then we see who gets it. It’s actually less effort, hahaha. I love these bird nests and can’t wait to try them. I am so in love the look of these but don’t eat grains…..what would be a good sub for oats? And what is the green you have the nests resting in? They are just sitting on a green plate. :) I’m not coming up with a good idea for how to replace oats. A combination of slivered nuts and seeds of some sort?